Fat Mike sent this animated gif of Brian Wilson. Awesome. There has been a good amount of hype with Square in technology news so I decided to sign up and try it myself. Fast forward 6+ months later… I received my newly created Square swiper. Although, I don’t foresee the need to take credit card payments in the near future, I charged myself $1 and here are some quick thoughts. 1. Excellent user experience. 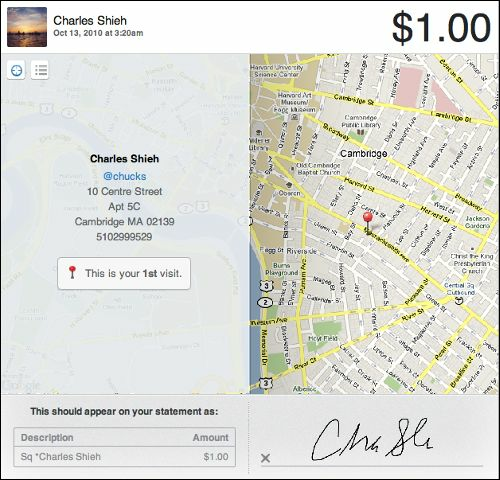 They nailed the charge entry page, signature, and receipt. There are improvements that could be made, but it is simple and sweet. 2. Pricing seems reasonable. Compared to other merchant accounts, I think the percentages are not bad. I’d be comparing these costs with my current credit card costs if I were a small business. Future marketing campaign for Square? 4. Slow authorization speeds. This isn’t really Square’s fault than it is At&t’s, but it still does negatively impact my overall experience.